The Wimmer Cemetery Association, Inc. is a not for profit group of citizens dedicated to the restoration and preservation of the Wimmer Cemetery in Auburn, Illinois. Members of the Association will strive to celebrate the history of this site through restoration of the rural landscape and environment, beautification of the property and completion of genealogical research of the persons interred here as their final resting place. It is the mission of the Wimmer Cemetery Association, Inc. to document the history, development and growth of Auburn Township and its citizens through restoration and upkeep of the cemetery and detailed records of Wimmer Cemetery family and ancestors. Upon restoration, the Cemetery will be available for school research field trips, family gatherings, and genealogical and historical research and documentation as well as a place for Revolutionary and Civil War reenactments. It will also serve as a place of tribute for present and future generations to honor ancestors and family traditions. 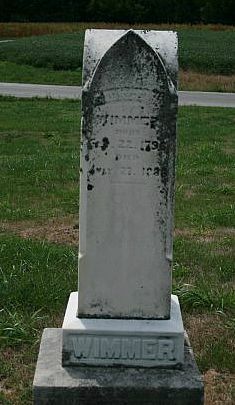 The Wimmer Cemetery is located in rural Auburn township east of Auburn, Illinois, on Route 104, one-half mile south on Dixon Road. At present, the Wimmer Cemetery Association, Inc. has documented and verified over one hundred and seventy gravesites dating from 1828 through 1934.